Posted By PA Breast Cancer Coalition on December 15th, 2015 at 10:52 am | 0 comments. Have you heard? Not only are 3D mammograms covered for women insured under Pennsylvania law, they are now covered for women insured by PA Medicaid. As of December 1, 2015, PA Medicaid participants are eligible to receive 3D mammograms at the same coverage level as traditional 2D mammograms. Thanks to the commitment of Governor Tom Wolf and First Lady Frances Wolf, Pennsylvania became the first state in the nation to consider 3D mammograms exactly what they are: mammograms. On October 5, 2015 at the PA Breast Cancer Coalition Conference, First Lady Frances Wolf announced that insurers must cover 3D mammograms at no cost to women over the age of 40. 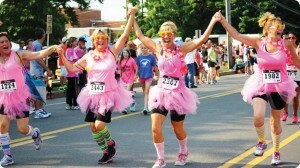 The move clarifies an existing law that the PA Breast Cancer Coalition worked to pass in the 1990s. Thanks to YOUR help, 3D mammograms are now covered for women insured by PA Medicaid. 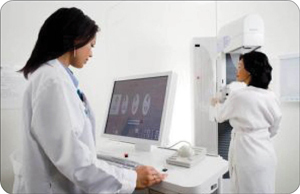 As of October 5, 2015, insurers covered under state law are also offering 3D mammogram coverage. We’re honored to take action with you! You. YOU are the reason the PA Breast Cancer Coalition is able to help breast cancer survivors, support their families, advocate for the women of Pennsylvania and award research grants to outstanding scientists in our state. Grassroots Partners continue to amaze us with their creative ways to make an impact. You’ve organized walks, dress-down days, football games, tea parties – even a boatload of bras! You’ve opened the doors to your restaurants, car dealerships, banks, grocery stores and everywhere in between to further our mission of finding a cure for breast cancer now… so our daughters won’t have to. For that, we thank you. Women facing breast cancer, families and researchers thank you, too for making a difference. Posted By PA Breast Cancer Coalition on December 15th, 2015 at 8:24 am | 0 comments. Going through having breast cancer made me stop and think about the important things. I came up with five: faith, family, friends, food, and flowers. In December 2000 I went for my regular six-month checkup. At first the doctor thought what was discovered on my breast was a cyst. But being a nurse, I knew when they kept pausing that something was wrong. It was stage 4 breast cancer. It was suggested that I could wait a few months but I didn’t want to do that. Fortunately, we found a surgeon who was willing to do it right away. I was 75 years old at the time of diagnosis and the chemo and radiation really knocked the pep out of me. I believe my faith got me through. It’s become more and more important as I’ve gotten older. 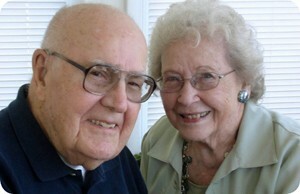 My husband Dave and I have been members of the Grandview United Methodist Church for 60 years. Recently the Sunday school children presented us with roses to commemorate that. Family is, of course, the other thing I relied on, especially Dave and our children. We have three sons, one daughter, seven grandchildren and five great-granddaughters. As far as food and flowers, my mother taught me about nutrition. I knew all about it before the exam in nursing school. I still eat five to six servings of fruit and vegetables every day. It’s easy if you think about it. And flowers … oh my gosh what would I do without my garden and my sunporch! Another thing that helped that first year was listening to good music. I like opera and classical music and jazz. Five years ago, Dave and I got a book about tai chi and we practice that every day for 15-20 minutes and we use a stationary bike. I really believe in tai chi and it helps a lot with balance. Cancer can do a lot of things but it can’t take everything away from you either, especially those five most important things. Posted By PA Breast Cancer Coalition on December 15th, 2015 at 8:23 am | 0 comments. 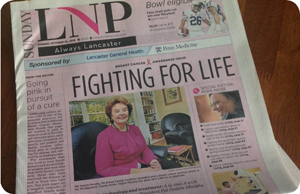 LNP (Lancaster Newspapers) washed the pages of its October 25th Sunday News edition in “pink in pursuit of a cure”, and featured an interview with PA Breast Cancer Coalition President and Founder Pat Halpin-Murphy on the front page! The pink initiative went much further than simply transforming the color of its pages—it was all to help bring awareness to National Breast Cancer Awareness month, honor and memorialize breast cancer survivors and those who have lost their battle, and recognize the health care providers and advocates who empower and embrace the cause. PBCC Board Member and Vice President for the South Central Region, Alice Sanders, was also featured in a spotlight interview in the Living Section. In addition, these pink pages generated a donation of over $17,000 for the PBCC—all from ad sales that chose to go “pink” for a day! The LNP Pink Edition was a historic and meaningful initiative that was a huge success in its first year. Thank you to Barbara Hough Roda, LNP Executive Editor and everyone who sponsored an ad in this special edition!